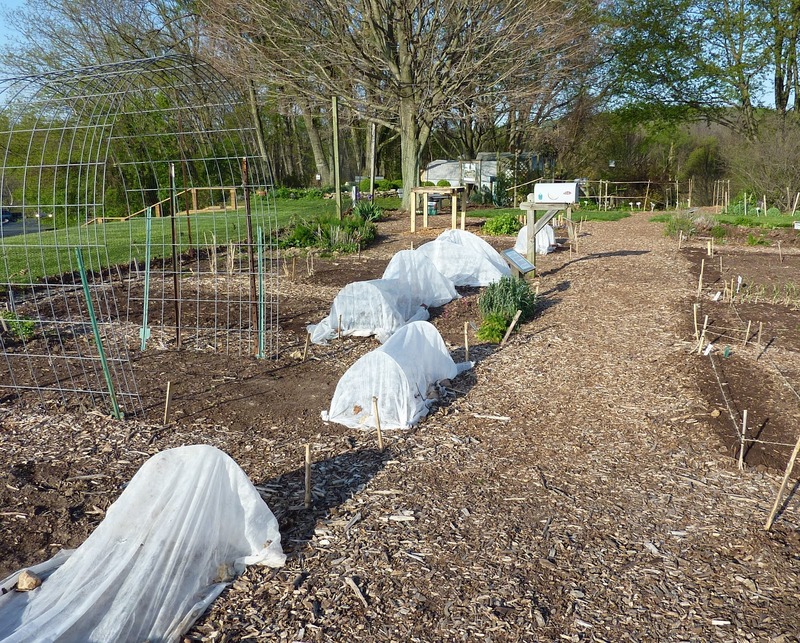 This exciting photo shows the Montgomery County MG Demo Garden: Vegetable Division, as it looked yesterday morning (after we’d fixed all the row covers blown off by high winds). We are four weeks into the season, having made an early start due to that warm weather we had back in March, that has since disappeared. The veggie garden so far is mostly row covers and sticks in the ground, but more will be showing soon. If you’re in the area, please mark your calendars for May 19, 10 am-12 noon, for our Veggie Gardening 101 event. We will have vegetable gardening classes for beginners, a plant clinic, a plant sale, and much more including demonstrations in our demonstration garden, and a chance to see what’s growing and ask questions. More on that later! We’ve made a breezy, chilly start on the Year of Leafy Greens. The seedlings went into the ground at the beginning of April, just in time for cold dry weather in which they are struggling to survive, let alone thrive. Row covers help, when they stay on (they are all anchored more securely now). We’re having to water much more frequently than we’re used to at this time of year. Where are our April showers? Hopefully we will have the drip irrigation system set up soon. I’ll check back and show you the plants that make it through. Think good thoughts about my purple pak choi! And speaking of leafy greens, I pulled out 35 gallons (5 gallon bucket filled 7 times) of garlic mustard in my back yard this morning (and there is a lot left). Yes, garlic mustard is edible. But not that much of it.